I'll be in Michigan for about two more weeks, finishing up various grad school tasks that I can't do from home in California. 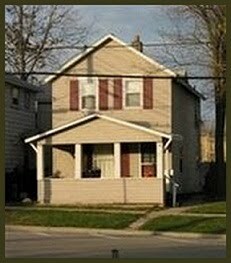 I'm staying in my old apartment in Ann Arbor, which I've begun referring to as "tiny house." It's a quirky little upstairs apartment in a ramshackle old house with very low ceilings and no parallel lines or right angles to speak of, anywhere. It's been a longer-than-usual trip, and tiny house is starting to wear on my nerves. In particular, the kitchen makes me sad. It's always been small and scruffy, but now it's also severely under-equipped. I took loads of kitchen gear with me when I moved away last spring, and my little kitchen in Michigan is left with a few odds and ends and not much else. Three weeks into the trip, I've had my fill of canned soup and pasta, the only things I'm able to make. So, I finally invested in a sharp knife and a small wooden cutting board, and I am happy to report that I'm feeling much better. Chopping things up can be therapeutic, and eating chopped-up things feels pretty good, too. Last weekend I used my new tools to make my favorite fresh salsa. It's one of those recipes where you have to trust your judgement on all the quantities because the ingredients are a little bit different every time you buy them. The starting point for this salsa is a fantastic pico de gallo recipe from The Border Cookbook by Cheryl Alters Jamison and Bill Jamison. 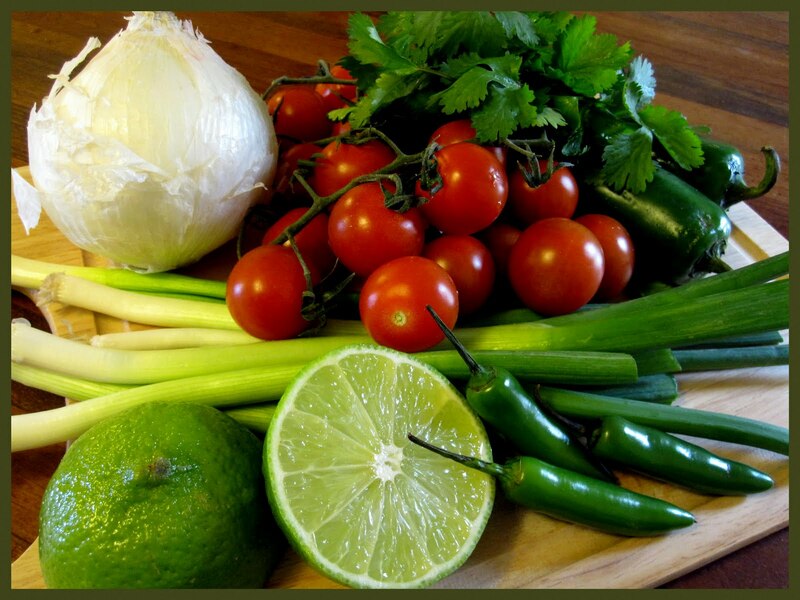 Their recipe calls for fresh tomatoes, green and white onions, jalapeños, cilantro, lime juice, and salt. It has a really nice flavor, but I've made a few adjustments to account for the fact that garden-ripe tomatoes and small, spicy jalapeño peppers aren't always easy to find. Unless I have access to really nice summer tomatoes, I prefer to use high-quality canned tomatoes in this salsa. 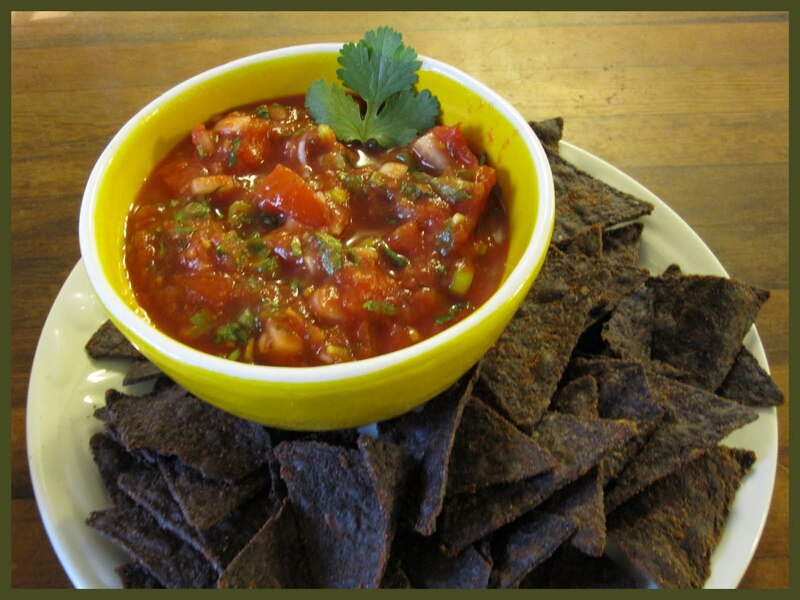 A mixture of crushed and diced tomatoes makes for a chunky salsa with a thick, smooth base. Jalapeños provide heat in the original pico de gallo recipe, but the jalapeños at my grocery store are sometimes (often) huge, bitter, and decidedly un-spicy. So, I've started using a mixture of jalapeños and serrano or habañero peppers to make certain that the salsa has some kick. After everything is chopped and mixed together, it's a good idea to let the flavors intermingle for at least 30 minutes in the refrigerator, then to taste the salsa and add additional amounts of the ingredients as necessary to get a nice balance of flavors. It's also important to stir in a good amount of salt to brighten up the salsa and make it taste more like a condiment and less like some kind of weird gazpacho. I like to make a large batch of this salsa. It's great with chips, but it also tastes amazing on tacos, over beans and rice, or mixed with avocado for a quick guacamole. Adapded from The Border Cookbook: Authentic Home Cooking of the American Southwest and Northern Mexico by Cheryl Alters Jamison and Bill Jamison. Stir everything together and refrigerate for 30 minutes or longer. Adjust the flavors and serve. After the gloom of winter, the first few days of spring feel pretty magical. The sun's rays are bright and warm. The air is charged with happy energy. It's time to close your eyes, take a deep breath, and let out a long, contented sigh. Summer is on its way. Now, can I interest you in a glass of fresh-squeezed lemonade? The lemons will be bracingly sour. The sugar will be pleasantly sweet. The ice cubes will chime in the glass. And the sun will shine down on the whole concoction in a most becoming way. I can give you a bendy straw, if you like. What do you say? How about some lemonade? 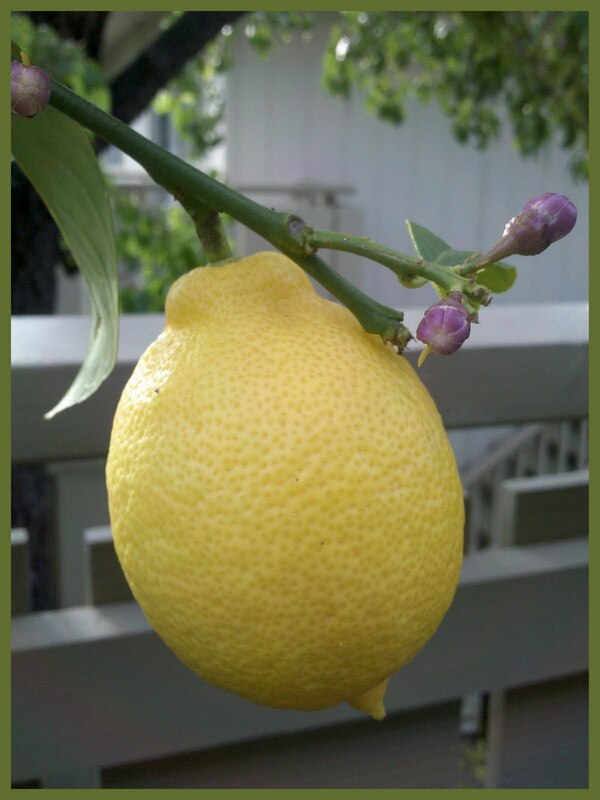 We have a little lemon tree in a clay pot on our patio, and our tree is suddenly heavy with lots of big, gorgeous lemons. Are they ripe? We weren't sure, but we figured even the sourest lemons would make decent lemonade. As it turns out, the lemons are ripe and the lemonade we made with them was fantastic. It's common knowledge that lemonade is made of lemon juice and sugar and water. I don't have any special lemonade recipe to share. The main purpose of this post is just to write the word "lemonade" a bunch of times so that you'll be inspired to make some. Lemonade. Lemonade. Lemonade. Also, I'd like to suggest that you make your lemonade according to the common knowledge recipe (lemon juice, sugar, water), instead of resorting to a powder or a concentrate. It will take just a tiny bit of effort and taste much better than any other lemonade out there. Start by squeezing the juice from four or five lemons. Pour the juice into a jar. Next, make some simple syrup. Mix one cup of water and one cup of sugar in a saucepan and heat the mixture until the sugar dissolves. Pour this syrup into a second jar. Now you're ready to mix up some lemonade. Fill a glass about 3/4 full of ice and water. Stir in tablespoonfuls of lemon juice and simple syrup until your lemonade tastes just right. After you've enjoyed that first glass of lemonade, stash your jars of lemon juice and simple syrup in the refrigerator so that you can mix up additional glasses of lemonade whenever the sun is shining and the mood strikes. Or, scale up and make a pitcher for a crowd. Yum. 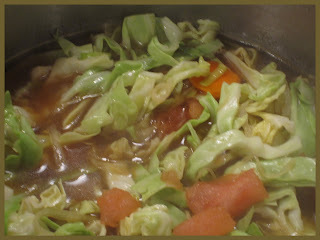 This cabbage soup, or shchi, is a good soup. It tastes good. It's full of good, healthy, vegetables. The ingredients cost next to nothing. And it's easy to make. You should make some of this soup right now, even if you're not hungry, because you will certainly want some later, after the flavors have melded a bit and the soup begins to call to you from the stove top or the refrigerator: "Eat me right now. I am hearty and delicious. I will not disappoint. I am a good soup." I'll admit that the words "cabbage soup" wouldn't ordinarily set my appetite on fire and send me running for a wooden spoon and a stockpot. But the combination of flavors in this soup succeeds in turning ho-hum cabbage into something special. Leeks and carrots lend the soup mild sweetness. A tomato adds bright acidic flavor. 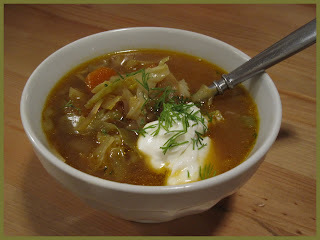 And a modest addition of sauerkraut gives the soup a hefty tang that enhances the flavor of the fresh cabbage. A blob of sour cream and a sprinkling of fresh dill provide the finishing touches that make this soup sing. Darra Goldstein notes that shchi is "the most Russian of soups." Traditionally, winter versions of this soup are made with fermented cabbage only, while summer versions forgo the fermented stuff in favor of lots of fresh cabbage. Goldstein's recipe combines fresh and fermented cabbage to produce a light soup with rich undertones. To make the soup, begin by softening a carrot, a leek, and an onion in butter. Then add beef stock, a chopped tomato, some sauerkraut, and heaps of raw cabbage. 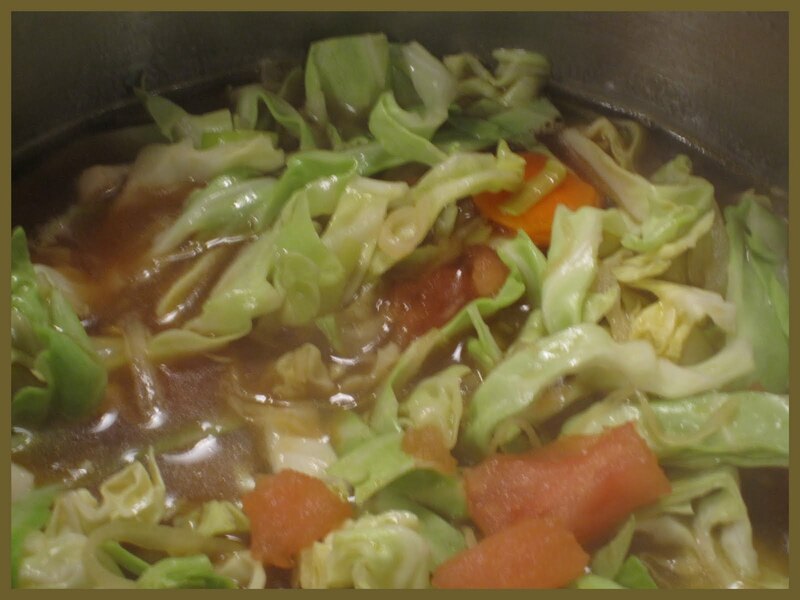 Simmer the soup until the cabbage is tender. Very simple, very tasty. And, happily, cabbage is very good for you. Yay. Adapted from A Taste of Russia: A Cookbook of Russian Hospitality by Darra Goldstein. Serves 4 to 6. Melt the butter in a large stockpot and stir in the onions, leeks, and carrots. Cook over medium-low heat for 5 to 10 minutes, until the vegetables begin to soften. Do not let the vegetables brown. Meanwhile, cut a small "x" in the skin at the bottom of the tomato and submerge it in boiling water until the skin begins to curl. Remove the tomato from the water and peel the skin away with your fingers, then slice the tomato in half and squeeze out the seeds. Chop the tomato coarsely. You can use canned tomatoes or a few tablespoons of tomato paste in a pinch, but fresh tomato is really nice in this soup. Turn the burner to high and add 5 cups of beef stock to the pot with the onions, leeks and carrots. Stir in the cabbage, sauerkraut, and tomato. When the soup comes to a boil, cover the pot, reduce the heat to low, and simmer for about 45 minutes, stirring occasionally. The soup is ready when the cabbage is tender. The soup is overdone when the cabbage is a mushy, soggy mess. Try to avoid this sad fate. Season with salt and freshly ground pepper to taste. Ladle the soup into serving bowls, then put a dollop of sour cream in each bowl. Don't skip the sour cream if you can help it, but if you do choose to leave it out, try adding a little bit of sauerkraut juice or a dash of vinegar to the soup to get the right salty/sour/sweet balance. Sprinkle with finely chopped dill and serve.